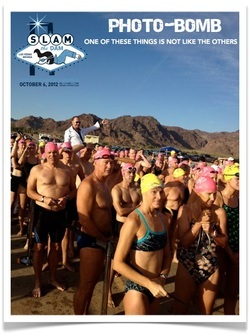 We are just a few weeks out from the 4th Annual Slam The Dam Open Water Swim in Fabulous Las Vegas. Our volunteers are working in overdrive preparing for a great day on the water. Mother nature has also been working hard these past few weeks with monsoon type rain and cooler temperatures, but we know things will be warming up again! By far, the most frequent question we are asked is "What's the water temp on race day?" The current water temp is 82º. The past 3 years, race day water temp has been 80º and we expect it to be the same this year. PACKET PICK UP: October 4th from 4-7 p.m. at REI Henderson on the north entrance of "The District." The District is currently under construction so plan accordingly. There, you'll have an opportunity for a pre -race massage by Massage Envy, peruse our awesome custom designed Slam-Swag (newly designed tech shirts, hoodies and long sleeve shirts) and take advantage of REI's annual sale. You'll need to bring a valid ID to receive your goodie bag, event cap, race shirt and race tattoo (please go light on the sunscreen until after we body mark you.) We apologize if this is an inconvenience for you, but we have found that you will be less stressed on race day if all you have to do is show up and be accounted for. New for this year: when 8K and Grand Slammers check in, you will get your kayak information packet to help streamline the race morning flow. REFUNDS/TRANSFERS: Transfers will be accepted through September 16th. Current rates apply. Please email the race director if you have a change (slamthedam@gmail.com). Unfortunately the date for refunds has passed. If you can not make the race, please let us know and we will try to make arrangements to send you your swag after the race. WARM UP: The 2.4 & 1.2 m course is open for warm up sunrise to 7:45 am. Because several races are already in progress, the 1.2 m swimmers may only warm up before 8 am. Swimmers at Boulder Beach will need to stay inside the white buoy line and be on shore for the safety briefing 15 minutes prior to your race. Swimmers for the 8k/Grand Slam will have ample time for a warm up after the safety briefing. 7:00 AM- 8K RACE BEGINS! 7:45 AM-Mandatory Safety Briefing, waters edge. All swimmers must be out of the water an accounted for by volunteers in the corrals. 8K/Grand Slam paddler names must be submitted prior to the race. If you reserved through the RD, you will be put in touch with your paddler the week of Sept. 30. If you reserved through Kayak Las Vegas, please confirm with them the status of your paddler. If you do NOT have a paddler on race day, we can't let you swim. Them's the rules. That's all for now folks, keep up your training and we look forward to swimming with you!